Cook quinoa according to package directions then set aside. In food processor add basil, lemon juice, nutritional yeast, olive oil, and garlic processing until smooth. Set mixture aside. In a bowl take quinoa, basil mixture, beans, peppers, tomato and onions, mixing until well distributed. 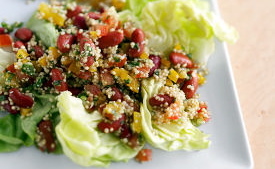 Serve quinoa in bibb lettuce wraps. Fantastic site, and it appears like you have a ton much more visitors as well, since the last time I had been here. Ciao! Fortunate we ran across this excellent website. Great help!